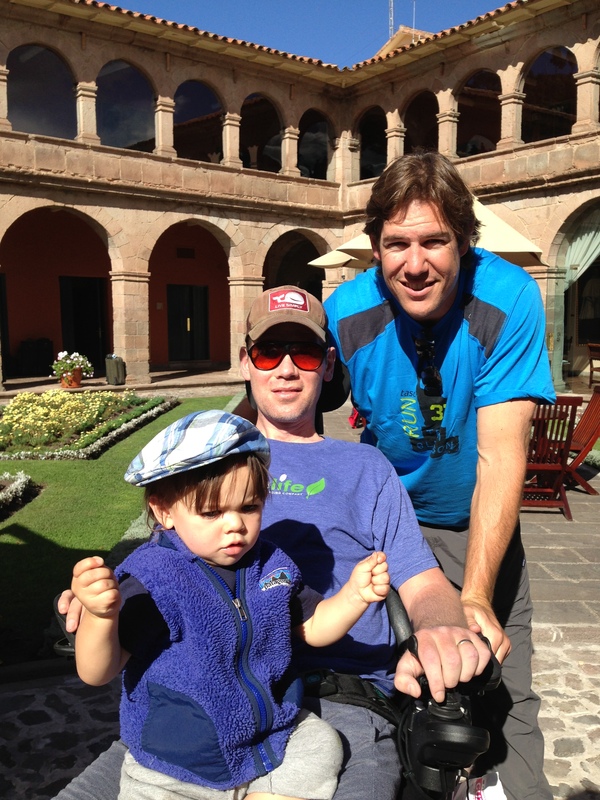 Team Gleason is in the memory-making business. As you probably noticed in Steve’s blog post Wednesday, he doesn’t do anything half-speed. Sure, ALS is a challenge. He can’t dive head first into a river like he once did. Or pull his own rip-cord after jumping out of an airplane. Or even put on his own shirt or brush his own teeth. But that’s what friends and family are for. This is a team effort. And as our captain, his command is perfectly clear: Full speed ahead. Keep exploring. Smile. Laugh. This ain’t gonna be easy, but it’s gonna be awesome. Steve is always cooking up crazy ideas. “Let’s go to Machu Picchu,” he says. “Okay,” you respond, almost as if you’re asking a question. This is one of those adventures where you don’t quite know what to expect. There are moments when you even wonder how we’re going to pull this off. So how are we going to pull this off? I actually have no idea. But part of the fun is figuring things out on the go. And somehow, Team Gleason always does. 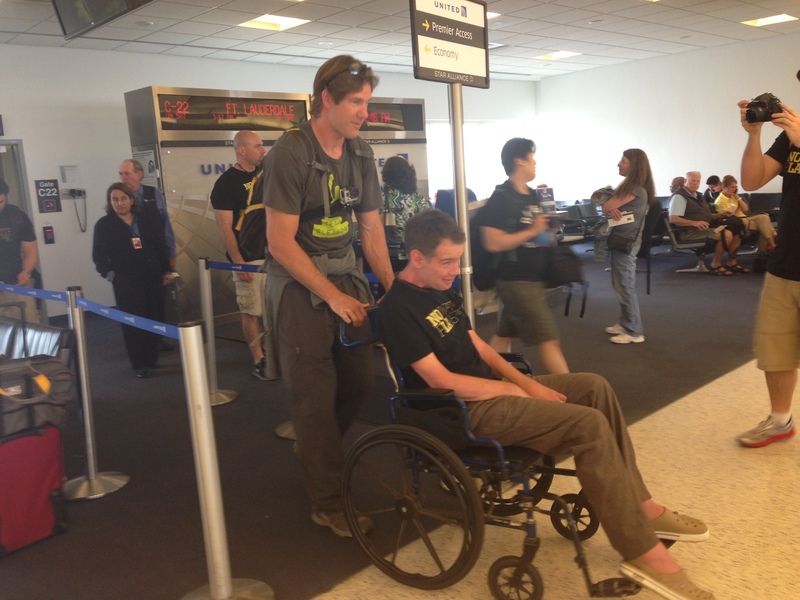 The majority of the Team Gleason travel party met up in Houston on Tuesday afternoon to board a flight to Lima, Peru. With a group our size — which includes an 18-month old boy, lots of heavy, questionable looking high-tech equipment, a bunch of Type-A workaholics riddled with varying degrees of O.C.D., an NFL Films crew with plenty of their own questionable looking high-tech equipment, and, of course, a man who is 27 months into an ALS diagnosis — there are recipes for disaster everywhere. And even as a few bags get lost, and room reservations get botched, and a restaurant is closed when we need it to be open, one thing doesn’t change: Team Gleason never stops smiling. We never stop laughing. Full speed ahead, no matter what gets thrown our way. That’s the charge from our captain. Our first group dinner in Lima was at Pampa de Amancaes, a restaurant with Peruvian cuisine recommended from concierge at our hotel, the Miraflores Park. At dinner, Michel asked everyone to share what she phrased a “self-mutilating story” from their past. Naturally, laughter followed. Then Steve asked everyone to share their top 3 memories from our first 24 hours in Peru. Responses poured out of everybody — Rivers dancing on the dining table; Suzanne’s reaction to news that The Cure was staying at our hotel; Blair’s tour guide performance on the bus ride to Miraflores. Again, more laughter. In fact, the laugher itself was what inspired my top memory that day. It might seem strange to say this, but one of the “good” things about ALS is that it leads to uncontrollable laughter from Steve when he hears something funny. It’s one of those deep, contagious, on-going belly laughs that actually leaves him momentarily breathless. And I love hearing it. When we discovered that the Team Gleason bus apparently doesn’t exceed 10 MPH, there were a LOT of jokes that followed. (I don’t think the bus driver is my biggest fan right now.) And from Steve, there was a LOT of uncontrollable, contagious belly laughter. That was my favorite memory from our first day in Peru. Asking for everyone’s “top 3 memories” on the first day of a long journey seems a big soon, right? But it’s not, because Team Gleason is in the memory-making business. I read this with such emotion…I feel as though I’m with you all! My not be physically, but surely spiritually. Can’t wait for the next Blog!!! Well, Scott Fujitta, you’ve just ‘one-upped’ Steve again. You made awesome look easy! Good people; the whole bunch of y’all. Enjoy Peru lovely Country Awesome post!! Hope all is well and ends well!! Prayers love and support go out to you and Steve and the whole Team Gleason Crew! Who Dat!! Just a thought – life’s greatest lessons teach us the value of friendship, family and love. Steve is one of the finest teachers around. God bless him. Amazing story, post and adventure. This is what life is all about. Congratulations on your ‘retirement’ am sure many adventures and fun times await in the future. family, and friends have embraced ALS! will inspire others for years to come! So wonderful that you all are able to share so many adventures and experiences together. In my mind laughter is one thing that makes life most worth living, especially when you’re able to share it with those you care deeply about. I appreciate reading all of the posts. Thank you all for sharing your experiences. Have fun!